Iconic actress Sridevi lost her life in February last year. Read what the Kapoor family are doing to mark this day of grief. Legendary actress Sridevi's sudden demise had shocked the entire nation. It was not only the Kapoor family but the whole of Bollywood mourned her death. The actress lost her life on 24th February at a hotel in Dubai due to accidental drowning in the bathtub. Now after a year and to mark Sridevi's first death anniversary, her husband Boney Kapoor and her daughters Janhvi and Khushi Kapoor will hold a Pooja on 14th February. A report in DNA revealed, "Though the actress passed away on February 24, 2018, as per the tithi, her death anniversary will be observed on February 14. The rituals that take place for the barsi will be held at her Chennai home, which is right next to Dr M Karunanidhi's residence. 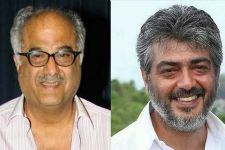 Boney Kapoor along with daughters Janhvi and Khushi will be present there. Anil Kapoor's wife, Sunita, as well as some of the other close family members, will also be present". It will be a year now but the Kapoor clan is yet to come to terms with the loss of this amazing human. Sridevi was elated to see her daughter Janhvi Kapoor's debut film 'Dhadak' but passed away months before the release of the film. In an earlier interview, Janhvi had shared that she was happy that her mother few bits and pieces of the film and also appreciated her acting. Speaking of Sridevi, she was a superstar during her times. The actress is remembered for her work in films like Mr India, Chaalbaaz, Judaai, Laadla, Nagina, Chandni, English Vinglish, Mom among many others. No one can ever forget megastar Sridevi for her beauty and amazing acting... Get more details about her first death anniversary on Lopscoop. You can download Lopscoop from Google Playstore and earn extra money.